Stepping into Elske in Chicago is like stepping into a dream world. Chefs and co-owners Anna and David Posey have created a Scandinavian-inspired oasis of delicious food, beautiful design, and a gorgeous herb garden outside to boot. They're also huge champions of ugly produce! Anna and David have been incorporating Imperfect into their award-winning tasting menu for a number of months so we were so excited to sit down with Anna to better understand the mind of a ugly produce-supporting chef. What about Imperfect resonates with you as a chef? Art and design are important elements of Elske. How do you think about the appearance of fruits and vegetables at the restaurant? AP: “As an artist, I find beauty in imperfection. At figure drawing, I love drawing the not perfect model. Fruits and vegetables are like that too - you have to find beauty in the imperfect." How do you think about waste in your kitchen and what do you do to avoid it? AP: “That’s a big one for us. Naturally, we avoid it. We take any fruit and vegetable waste or trimmings and smoke it over our hearth. Then we steep it in water and make this really savory tea that’s the first course in the tasting menu and it’s been on since day one. It's very savory and umami. It's mushroom stems, apple peelings, trimmings, dried fennel, a lot of stuff that we get in our Imperfect boxes too (pictured above). We steep that and pair it with a little rye cracker, and if we get radishes on something like that in our Imperfect box we’ll make a quick pickle or salt them to sit on top of the cracker. It’s very Danish style, smørrebrød, and that's the first bite. How do you incorporate produce into baking? What are other ways that Elske practices sustainability? Is it important to your customers and diners? AP: “Waste and trying not to waste is a big one for us. We’re conscious of that whether it’s going into staff meal or going into what our diners eat. It helps us keep our cost down for consumers also. I think it’s a natural way that chefs need to start living and thinking because the world needs to be a more sustainable place. Besides that, we have a garden where we get a lot of herbs. We’re working on our rooftop garden this year. Here at Elske, we are trying to be good human beings." 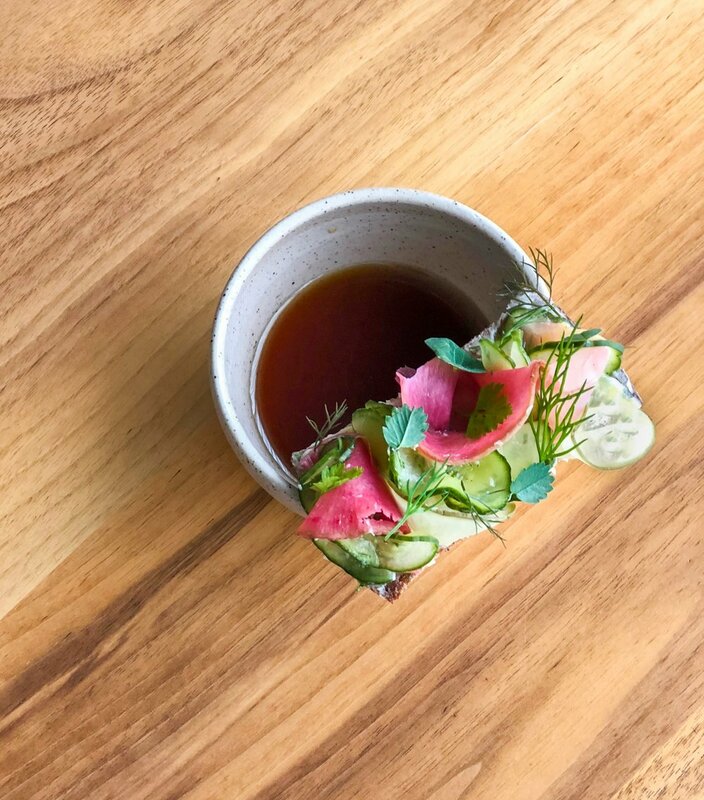 Thanks for reading and be sure to check out Elske in Chicago or follow along with them at @elskerestaurant!